The crux of the film was the disagreement between scientists, policy makers, and the few remaining Cod fishermen of Gloucester, MA, as to the status of Atlantic Cod stocks in the Gulf of Maine. Scientists at the Gulf of Maine research institute cited climate change as the trigger for the struggling Cod populations, originally reported in this 2015 study. John Bullard, regional administrator for NOAA Fisheries echoed similar studies for his policy decisions. “Scientists say Cod now is at 3 to 4 percent of its historical abundance. When something is at 3 to 4 percent, it’s time to worry,” explained Bullard. Squarely on the opposite side of this argument was the cod fishermen. They did indeed see these aggregations that Bullard described, but they did not agree that there were not enough Cod out there to fish, and furthermore they believed the government was lying to them. “There’s a lot of things to be learned in this business,” Cod fisherman Joe Orlando told the reporter. “What is one of the most important ones? Don’t trust the government,” replied Orlando. “NOAA Fisheries lies for a living, they don’t care they’d be happy if the fishery closed,” claimed David Goethel, another fisherman. CFoodUW notes that telling the story of New England cod and the conflict in estimates of abundance of fishermen and scientists does make for exciting film footage, but it does not reflect either the status of fish stocks in general in the U.S. or the normal state of relations between government science and industry. Many Cod populations around the north Atlantic are doing very well and the total abundance of Atlantic cod is quite high and growing. 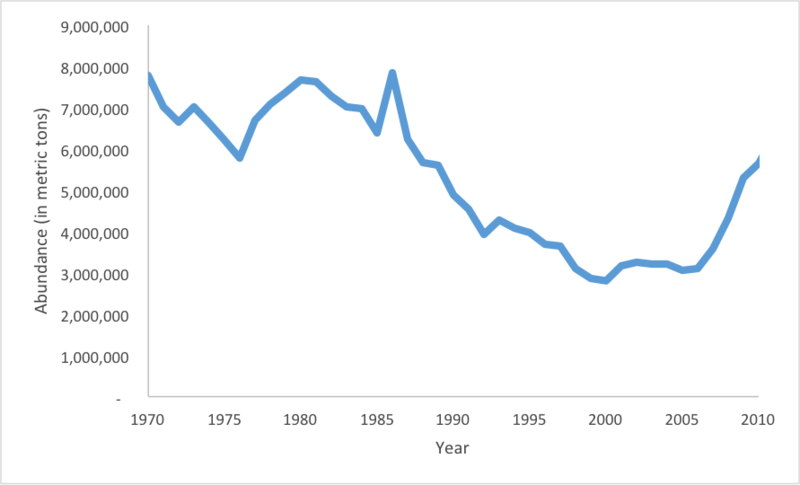 Abundance (in metric tons) of Atlantic cod from 1970 – 2010. The film concluded with a brief look at the burgeoning dogfish fishery, which is where a growing portion of the lost Cod fishing effort has gone in recent years. Dogfish fishermen that were interviewed appreciated the cheaper permit and the absence of an expensive on board observer and tracking device, which are necessary to legally fish for Cod in the same waters. The only estimates I trust are data. One would be the trawl survey cpt, and the other would be a recreational angler CPT.